Spider bites may be one of the most common bug bites which people think they have. Every year, thousands, if not millions of people around the world are bitten by spiders, but not all of those who think they got bitten by a spider have spider bites. Spiders are feared by humans from time immemorial. People have a deep seated fear of spiders and tend to blame any unexplained bug bite on the eight-legged creatures, so how do we identify real spider bites from other bug bites and how are they treated? Spider Bites – What do Spider Bites Look Like? Spider bites have a range of looks depending on which specific spider caused the bite. More so, a lot of those thought to be spider bites are actually bites from the two more common bugs, mosquitoes and bed bugs. The only 100% sure way of identifying spider bites is of course to see the spider actually causing the bite. For this reason, it is important to first rule out that a bite is caused by these two creatures before thinking it was caused by a spider. How does it look like? A spider bite can look from a single red dot, to a large dot inside a circular reddish mark, to two puncture wounds depending on the type of spider which caused it. A bed bug bite usually appears as reddish dots which are patterned in rows. Usually, it is also very red with a raised surface and can cause a welt which may manifest in 1-3 days. A mosquito bite often causes a reddish bump on the skin and can look pink to reddish in coloration. The mark can last for a day or more for people who are sensitive to it. How does it feel like? A spider bite can have a variety of symptoms and manifestations, again depending on the spider which caused it. There are bites which are not felt at the moment of biting and will only become evident after a few minutes, and there are some that feels like a sting or a stab as if coming from a needle. A bed bug bite feels very itchy and can look very inflamed. Symptoms may last a few days but can be ignored. A mosquito bite is very itchy and the itchiness can last a few minutes to a few hours for people with sensitivity. Where is the bite located? A spider bite can usually be seen on the hands and the arm, as oftentimes, a spider bites when a human disturbs it unknowingly. The bite can also be at the feet and legs and a lot less common, on other exposed parts of the body. A bed bug bite can manifest in any exposed area of the body, but they do tend to appear more in areas with thinner skin like the neck, face, inner part of the arm, and inner part of the legs. A mosquito bite can manifest in any exposed area of the body, but they do tend to appear more in areas with thinner skin like the neck, face, inner part of the arm, and inner part of the legs. Does it need medical attention? Spider bites may or may not need medical attention depending on which specific spider caused it. In the cases of the black widow, the hobo, and the brown recluse spider, it is recommended to seek immediate medical attention. Bed bug bites does not need medical attention. Mosquito bites does not need medical attention unless the mosquito is a carrier of a disease like Dengue Hemorrhagic Fever, West Nile virus, Malaria etc. Other important information For more information regarding spider bites, see the table below and our other articles about spider bites. For more information regarding bed bug bites, see our article about the topic. For more information regarding mosquito bites, see our article about the topic. Being certain that what a person has is not a mosquito bite or a bed bug bite is important and makes identifying spider bites easier and more accurate. Once a person is certain that he or she has been bitten by a spider, the next step is to identify what type of spider may have caused it to know what specific spider bite treatment will be needed later. Black Widow Spider A black widow bite usually is simply a red dot or a red spot. Fang marks might be visible on some cases. Toxic bite which can be very fatal. Immediate medical attention is advised. A black widow bite is described as very painful. The pain is very intense and immediate and is oftentimes accompanied by muscle cramping that lasts for days up to a few weeks. The elderly and the young are very vulnerable to the venom more so if they start manifesting nausea, and fever. Brown Recluse Spider A brown recluse spider bite can be easily identified by its bull’s eye appearance. There is a red dot in the center of a ring of red. After a few days, tissue around the area will change in color and will become darker together with the formation of a lesion which over time becomes an eschar, a leathery dark piece of skin which oftentimes needs surgery to be removed. More information about the brown recluse spider bite can be seen on our article about the bite of the brown recluse. Toxic bite which can cause severe complications. Immediate medical attention is advised. A brown recluse spider bite feels like a sting and will intensify within a few hours. The pain can also be described as a burning pain. Hobo Spider A hobo spider bite is oftentimes mistaken as a bite from a brown recluse, mainly because they both have the bull’s eye appearance of the bite itself. More information about the hobo spider bite can be seen on our article about the bite of the hobo spider. Toxic bite which can cause complications. Immediate medical attention is advised. A hobo spider bite is characterized by numbness along with muscle ache. Wolf Spider A wolf spider bite has fang marks on it, making it look severe, particularly if the fang marks are large enough to cause obvious skin tear. 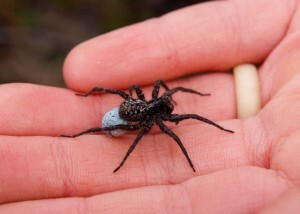 More information about the wolf spider bite can be seen on our article about the bite of the wolf spider. Venomous but non-toxic bite. Can be managed at home with simple spider bite first aid. A wolf spider bite can cause swelling and pain. Lymph nodes may show swelling and is a sign that the body is fighting off the spider’s venom. After identifying what kind of spider bite a person has, it is now time to know the next step, which is: How to treat a spider bite? 1. Spider bites need to be identified first as really a bite from a spider. 2. Elevate the part of the body bitten by a spider to see it better and to minimize the spread of the venom. Nearly all spider bites have venom that has been injected inside the bitten area. 3. Identify if the spider bite is from the hobo spider, the brown recluse, or the black widow. If so, seek immediate medical attention; but if not, proceed with the next steps. 4. If the bite is very new, wash it with mild soap and water or use an antibiotic cream to prevent it from getting infected. 5. Spider bites can trigger a reaction other than pain and swelling. Take note of and monitor the symptoms experienced. Antihistamines may be taken to minimize itching and acetaminophen may be taken to minimize the pain. 6. If symptoms worsen or goes beyond pain and swelling, immediately seek medical attention. Anything beyond pain, swelling and itchiness can be a complication of spider bites and must be taken seriously. Spider bites may be just simple bug bites or can be something more serious and be potentially fatal. With that in mind, it is important to arm one’s self with knowledge about spider bites plus how to identify and how to treat spider bites.